HD (Huntington’s disease) is an autosomal dominant inherited neurodegenerative disease that affects approximatively / 4–10 cases per 10 000 persons among Caucasians. The mutation causes an unstable huntingtin (htt) protein characterized by an expansion of the polyglutamine tract, leading to the formation of aggregates, decrease in the neurotrophic factor release, mitochondrial and vesicular trafficking impairment. The HD brain is characterized by loss of the MSNs (medium spiny neurons) of the striatum, enlargement of the ventricles and a corresponding shrinkage of the overlying cortex. 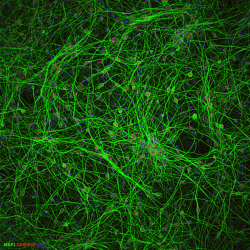 The GABAergic (γ-aminobutyric acid) cells are the most numerous neuronal cell type of the striatum (90–95% in rats and over 85% in humans), along with several small populations of interneurons. 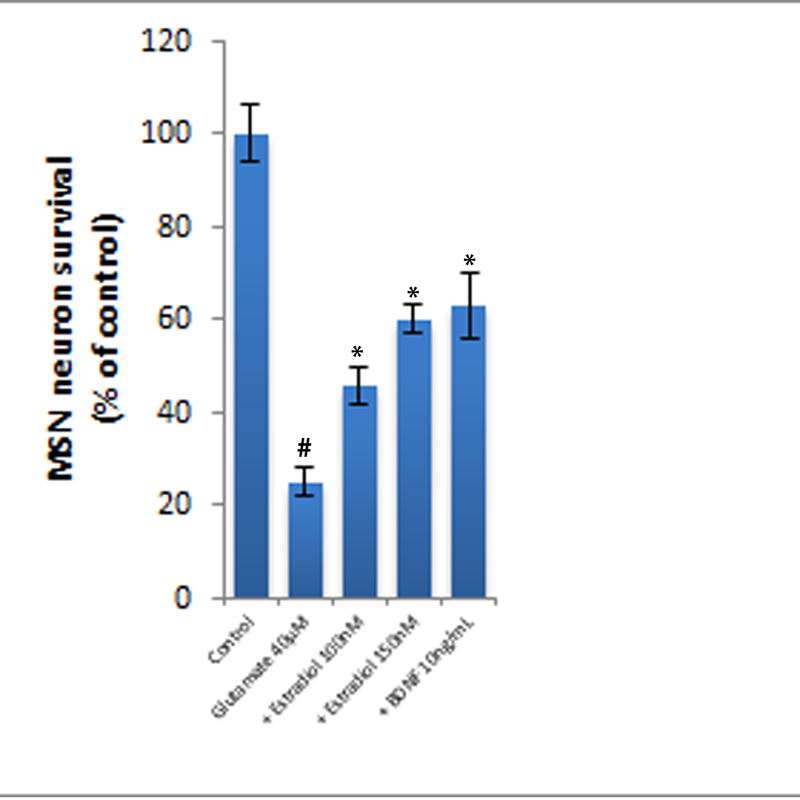 MSNs are characterized by their expression of DARPP-32, (dopamine- and cAMP-regulated phosphoprotein of 32 kDa). They receive the bulk of the input to the striatum, receiving afferents from the cortex, thalamus and midbrain, as well as being the major output neuron of the striatum, projecting to various regions of the CNS (central nervous system), including the globus pallidus and the substantia nigra. As such, they form complex neuronal loops within the basal ganglia which are important for the control of action, cognition and emotion. 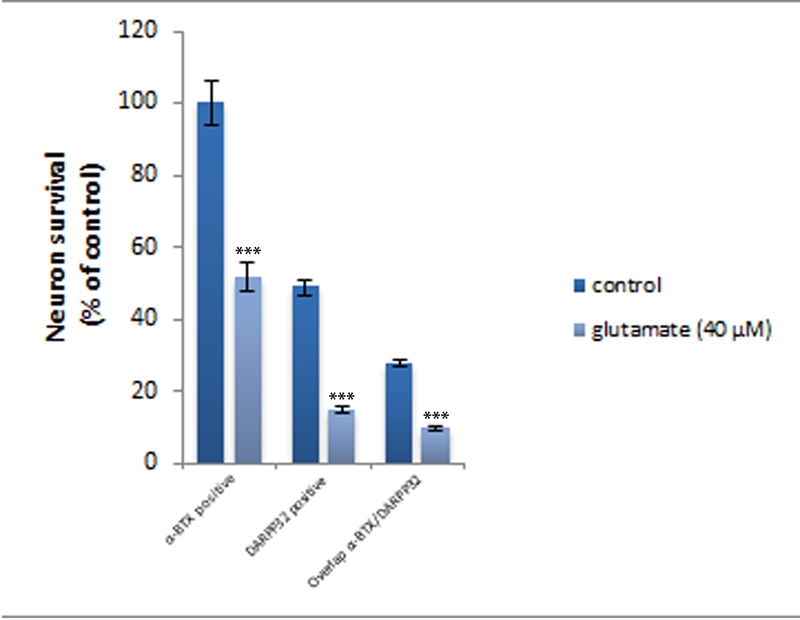 Significant evidence has accumulated to indicate a dysregulation of glutamate release in the striatum followed by a progressive disconnection between cortex and striatum conducing to early synaptic impairment in HD. So any molecule that is able to reverse glutamate-induced toxicity may be useful to prevent MSNs neuronal death caused by Huntington’s disease. 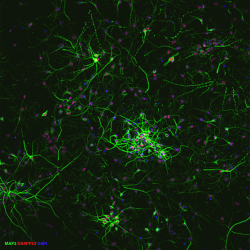 Synapse injury after Glutamate intoxication of MSNs neurons visualized by quantification of the α-bungarotoxine-DARPP32 overlap.